Combines the elegant fragrance and soothing properties of Rose absolute with the precious oils of Jojoba, Rosehip Seed and Borage. 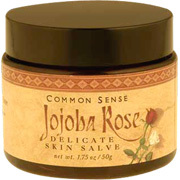 Can be used every day by all skin types. sweet almond oil, jojoba oil, beeswax, rose extract, aloe vera oil, d-alpha tocopheryl acetate (vit e), rosehip seed oil, borage oil, tocopherol (vit e), rosemary extract, siam benzoin absolute & bulgarian rose (essential oil). 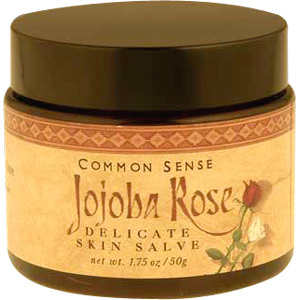 Jojoba Rose Salve is shipped in a discrete, unmarked package. Orders are processed immediately and usually take about 3 to 5 working days to be received. Any information received is used only for order processing and shipping purposes. Your information, such as e-mail address, will never be disclosed to a third party.